This blog is a combination of sharing inspiration where “Nature is combined with Art” and “Container Gardening” (my passion). If you have something to share about these two key themes in your gardening and art world, please feel free to contact us anytime by completing the contact form below. We have many guest artists showing their talents at our workshops and we hope you will join us to share your talents and passions. How would one describe Nature with Art? Container Crazy CT shares a pinboard of various items spotted on the web which define our idea of how nature is combined with art. Whether it is a twig carefully painted on a canvas or a ball of moss utilized to create a hanging arrangement of plants – the ideas of art forms are endless – but each speaks to the inner gardener and nature lover. Container Gardening, the highlight of this blog and a service offered by Container Crazy CT in Broad Brook, CT, is a form of combining nature with art. The pot or container used, how it is positioned in the garden to create drama or lead to special places, and the combination of plants used, all speak to combining nature with art. 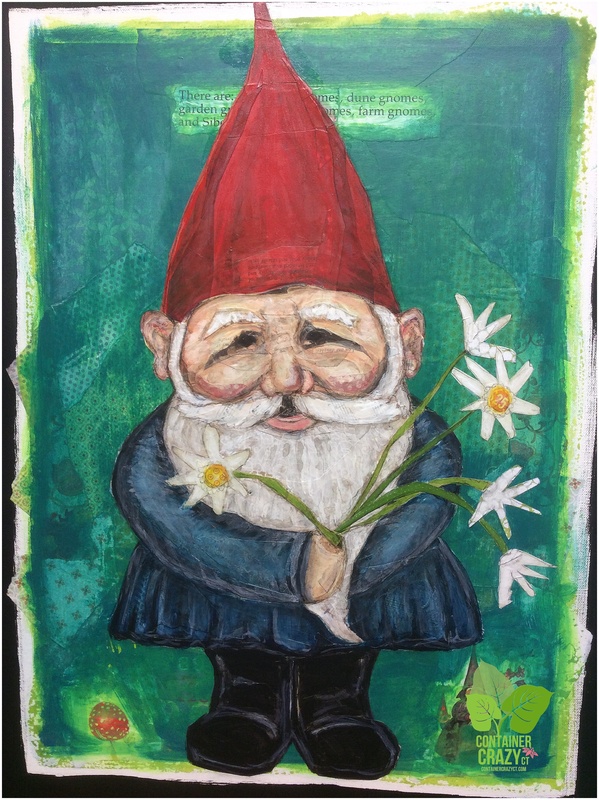 One of the reasons Container Crazy CT invites local guest artist to teach and share their art forms is because many forms of art are inspired by nature, plants, the environment, the sky, sun, moon – you name it. If you are an artist interested in teaching a class, please reach out. It will expose your talents to Container Crazy CT’s audience of nature lovers. We have held classes about jewelry making with sea glass, silk paintings of flowers, hypertufa pots, encaustic works with bees wax, miniature gardening, and more. To see what’s coming up, visit the menu bar on the top of this blog, Nature with Art Programs. Artsy head pots filled with plants is another form or example of when nature is combined with art. The whimsical style of hairdo’s you may create with the right plants and wonderful characters of face and head pots are endless. 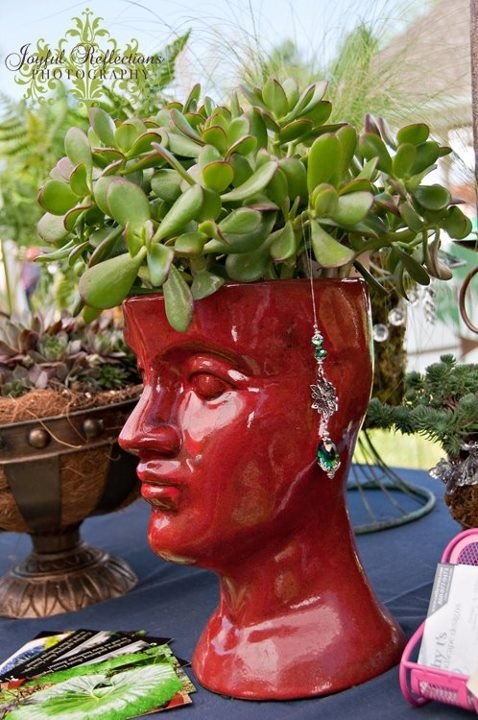 A funny face or fancy garden style head pot is not only fun but surprising in gardening spaces. 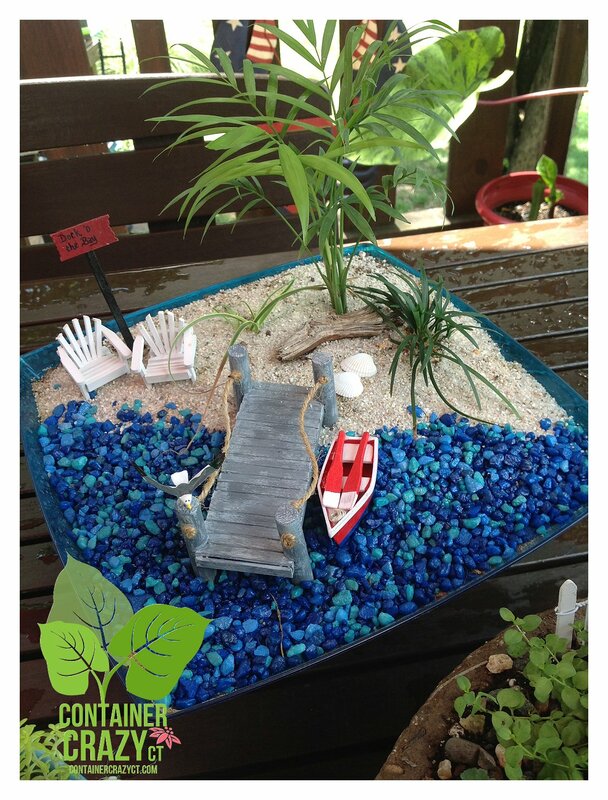 We have held sessions on how to create natural landscape scenes in miniature gardening style. Both were taught by Rhonda Niles of Gardening Inspirations. Here is an example of one of the miniature gardens below Container Crazy CT’s pinboard, also a great source of inspiration. Please share! Tell us your own examples of how you have combined nature with art in your gardens or container gardens?